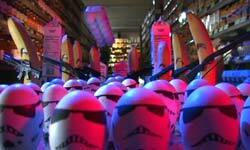 StoreWars.otg has put up a neat little movie spoofing Star Wars. The title, Grocery Store Wars, gives you some pretty good insight into the setting for this spoof. Starring characters with names like Obi Wan Cannoli and Chewbroccoli, follow their exploits against Darth Tater and and Chemically enhanced foods. Many Thanks to Jeff for the heads up! Brianstoys.com has put out their latest news letter. They have up for pre-order many of the upcoming Gentle Giant Statues, Mini-Busts, and Maquettes. 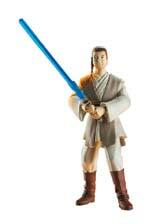 Also available are the Master Replicas Obi Wan and Anakin Scaled Lightsabers. Make sure to check them out! Eric from Orlando. Just thought I'd let you know, The Disney Darth Vader Mickey Mouse Beanbag Figures are now available (on a first come- first serve basis) at DisneyGallery.com. They're charging $12.00 each (limit 2) and $8.95 shipping & handling. Just thought you might want to post this. Take care! Many thanks to Eric for sending in the news! Gentle Giant has sent out a notice inforiming everyone that they have updated their site. on our Harry Potter line and the continuation of our Star Wars line with the Scout Trooper on Speeder Bike statue. Product information for our line of action figures for the PSP game - Death Jr, has also been added to our site. Darth Vader Carrying Case Found On April 2nd? 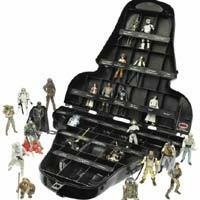 Hasbro posted to their website the other day news of a the Darth Vader Carrying Case being released this Spring. A JTA.com reader Corey sent in an email reminding us that this very same Case was made available for Midnight Madness with the same figures. Looks like Hasbro plans on releasing another wave of these. If you didn't get one before, keep an eye out! Special Thanks to Corey A. for the heads up! Kit 5" tall. For only $44.99 and be sure to check out our other Star Wars Mini Bust that we have limited numbers left. Brianstoys.com has put out their latest news letter. At the top they now have the Exclusive Clone Trooper 4 packs. They also have all your Revenge Of The Sith needs as well! Click on the banner to check them out! With the release of the movie, you are sure to see many polls asking what you thought of the movie. Our poll goes a little deeper than that into one of the potential debates that might come out of this movie. For the first 2 movies we had the Sidious/Palpatine Debate, and also the Stromtrooper/Clonetrooper debate. Those 2 debates have been soundly decided, however with E3, there is a chance to of a whole new debate, this one centering around the creation of Anakin Skywalker. 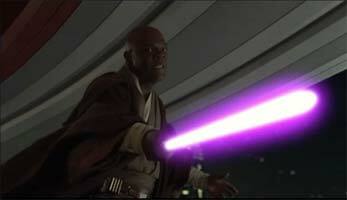 With the revelation that a Sith Lord was capable of manipulating the Midichlorians to create life, some are arguing that Anakin was created by someone other than the Force. What do you think? Vote in our poll, then head to our FORUMS and let us know in detail what you think! In the Hyperspace rotation on The Official Site they have posted a little ad announcing that they have "found" more C3 Vaders. 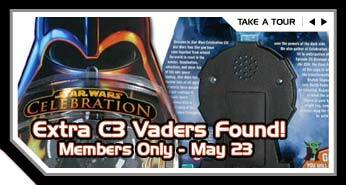 The Vaders will go on sale May 23rd, and will be available to members only! There is no info as far as numbers available and conditions. So stay Tuned! StarWars.com posted a nice, informative article on the old promotions that Burger King held way back during the Original Trilogies run. Tracing the history of the Burger King Collectible Glasses, and other BK promotional tie ins, this article is a good read for even just the sake of nostalgia. Also don't forget that Burger King is currently running a promotion for Revenge Of The Sith with their deformed mini figures. Click on the image below to check it out! Hasbro.com updated their site this week with news and images of the next wave of Collection 2 figures. Captain Antilles, a Utapaun Warrior, and Zett Jukassa make up this wave. Of note the character Zett Jukassa is the young Jedi Padawan played by Lucas' son Jett Lucas. He is the Padawan that we see gunned down by the Clones, right in front of Bail Organa, during the raid on the Jedi Temple. CNN has reported that ROTS has taken in a record $16.5 million for the midnight showings, outpacing all other midnight showings. The next closest contender was LOTR: Return of the King at $8 million! ROTK went on to tally $124 million over the long weekend! And, according to Fandango, sales have only increased since Wednesday! Read the whole article here. Millions have flocked to the theaters today to check out the last installment of the Star Wars Saga. There will be praise, there will be criticism, and surely there will be varying opinions on the movie. So what better way to make your opinion know then to head to our Forums and let us know what you thought! We want to hear you and your insight. Post a Full fledge review in the forums if you like! Head on over to the JediTempleWarRoom.com to check out our forums and let your voice be heard! Head into our Prequel Trilogy Section to check it out. Not a member of our forums? Click HERE to register! We have updated our JTA Page with a special on a Factory case of Col2 Wave 3 figures & a set of 4 Col2 Wave 2 figures. It's the same offer all around this week. We also have 13 different FSC available on our EII FSC page as well as expecting the Tarkin Wave before the end of the week. I'll let you know once your package goes out. night (May 19th) in Lexington. Tonight we'll be set up at the Showcase 16 Cinema De Lux (9700 Preston Crossing Blvd) in Louisville from 10 pm until the start of the midnight showing. Darth Vader and R2-D2 will be available for photographs (theater management asks us to remind everyone that cameras are allowed in the lobby, but not allowed in the actual theater) and members will be meeting and signing up new members at our dispaly booth. We will be handing out KSWCC buttons (while supplies last) and there will be a drawing for a Master Replicas F/X Lightsaber! Tomorrow night, May 19th, we will have our table set up at Regal Hamburg Pavilion 16 (1949 Star Shoot Parkway) in Lexington from 5:30 pm until the start of the 7:45 pm showing. Club members will be meeting and signing up new members at our display booth. Again, we will be handing out KSWCC buttons (while supplies last) and there will be another drawing for a Master Replicas F/X Lightsaber! Be sure to pick up one of these cool collectible buttons. If you live in Kentucky and are not a member of this group, head on over to find out more on how you can join. New In Stock! Star Wars Yoda Kotobukiya Pre-Painted Soft Vinyl Model Kit 5" tall for only $44.99. Also, be sure to check out our other Star Wars Mini Bust... we have limited numbers left! Brianstoys.com has sent out their latest newsletter packed with more Revenge Of The Sith Merchandise than you can shake a light saber at! Also check out the Kotobukiya models that they now have in stock! Click on the image below! The good people at BeforeTheDarkTimes.com have sent us word that they are now having a new contest over there. To enter the contest you have to write up a short excerpt about what Star Wars means to you. So head on over and check it out! LEGO is sending out word that if you pre-order the LEGO Death Star through LEGOshop.com, you will save $30 on your order! You can start to Pre-Order yours Monday May 16th at 12:01 AM! I don't need to tell you that this is a big week for Star Wars! 6 days until the premiere of the last movie, and all of the major news outlets are pasting Star Wars all over their pages! CNN reports in with a humorous story concerning the Economics of Sith. A cool story outlining how the premiere of ROTS will impact employees taking off (or skipping out) from work. USA Today has quite a few stories to get you pumped up for one Sith of a week on the front page of their Life section, including a Guide to the Galaxy, a nice little interactive slideshow letting you romp through a who's who of the Star Wars Universe. ET Movies and Yahoo Entertainment serve up a few stories giving you a rundown on all of the sneak preview premieres that have been taking place across the globe. These are just a small taste of the mouthful of Star Wars news happening right now! And, with only 6 days until the official premiere, you can bet your Wookie there will be tons more! soon; end of May the Jedi adventure ends for us. A lot of our crew members had changes going on in their private lives; as a result we won't be able to maintain the site properly and so we decided to end it in beauty. We will still honour the running initiatives, such as the Drawing Contest and the Star Force Charity Auction, but by the end of May we will close the site down. Be sure to head over for one last visit before this cool Star Wars site shuts down forever. Bejedi.com has been a great supporter for us here at JTA, especially when we were trying to get our site up and running. They will be a great loss not only as one of our best affiliates, but also to the Star Wars community. The good people over at www.StarconstruX.de have posted images of their first Episode 3 themed Diorama. 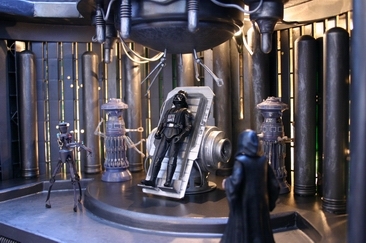 It features the final transformation of the beaten and broken Darth Vader. The diorama was created by Markus Gerlach. Click on the image below to check it out! There are now 3 scaled sabers available at Best Buy: The Best Buy exclusive Darth Sidious Saber, as well as Obi-Wan & Anakin's sabers from Revenge of the Sith. Click on any of the pictures below to order yours! Brians Toys writes in with their latest deals, which include the latest in all the basic figures, as well as some hard-to-find older figures. Check out the complete newsletter here. Alliance Collectibles now has the Entertainment Earth Exclusive Clone Troopers in Stock and ready to ship for a low price of $99.99 for a set of 16. You get all 4 versions of the Clone Troopers in this set. Make sure to head on over today though as this price is only good till Sunday! Click on the banner below to order yours today! StarWarsShop.com has opened it's virtual Celebration III Store Today. Not everything that was available at C3 is available at StarWarsShop.com, but, it's better than nothing. Check out the links below to order yours! CNN.com has an article up about some devoted fans that are standing in line in NYC. However this line isn't the usual line, it is for charity! The line is a benefit for the Starlight Starbright Children's Foundation. To read more click HERE. Brianstoys.com now has up for sale a few of the Celebration III exclusives. The Gentle Giant Sandtrooper, Master Replicas Scaled Saber, and the C3 Vader are all there, click on the image below to check them out! StarWarsShop.com now has up for sale the Limited Edition Scout Trooper and Speeder Bike Statue as well as the Kotobukiya 13" Revenge Of The Sith Darth Vader . The Vader ($99.99) ships September 10th, and the Scout Trooper ($199.99) Ships in November 2005. 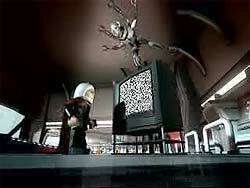 Also of note on the Vader is that this is the Episode 3 Revenge Of The Sith Version of the Dark Lord! To order yours click on the images below! Just wanted to make sure you knew about our very cool Star Wars issue, on sale this Friday. Part of the print run, available in WHSmiths, Tesco, Virgin, HMV and Forbidden Planet, features a breathing Darth Vader sound cover. Also With 50 pages of exclusive content, EMPIRE presents the definitive celebration of Star Wars Episode III: Revenge of the Sith, featuring exclusive behind-the-scenes access and interviews with Hayden Christensen, Natalie Portman, Ewan McGregor and many more. There is also the Ultimate Star Wars Poll. More than 40,000 readers have had their say on subjects including their favourite moments from the series, characters, droids and haircuts. PLUS Kevin Smith, Simon Pegg and Edgar Wright sit down to chat all things Star Wars.